This has been a year of shifting around what I do. I have a lot of detail about that, but if you want the quick version, skip to the end. The long version might be useful to someone else considering going in a similar direction. I’ve been writing and blogging for around eight years. In the last few years, I’ve had to acknowledge that I’d never really fit in when it came to the writing world. I’d spent years trying, but it wasn’t happening. A few people talk to me, but they’re usually on the fringes as well. If this was a social club, I’d have left years ago. But it’s a work environment, so it’s difficult to stop being involved entirely. What was for sure is continuing with more of the same would not change anything. I was spending a lot of energy on something that was never going anywhere. The big issue with my writing is that I write about characters and themes that make it hard to get by in the mainstream, but in all the wrong ways to be seen in the diversity community. The recent push for own voices work has pretty much guaranteed anything I write will sink, as so little of it can be promoted as own voices. I’ve always tended to write about the world around me, which includes a lot of people who aren’t like me. Even when a character is like me, it’s not really the narrative people expect from own voices. An example would be a non-white character of a specific race is expected, but a non-white character who isn’t sure of their own ancestry is not expected. People aren’t going to buy something when they’re not looking for it. So this year was about diversifying in a different context. If writing couldn’t be my career, maybe a whole lot of little things could combine to be a career. When I was trying to get reviews for my novel, I got a reply that hated the novel idea, but loved the cover. The cover had always got much more positive feedback than the novel itself. So late in 2015, I started up an art store on Zazzle. I chose Zazzle because it’s a large site with a wide variety of products. If my art was going to sell anywhere, it’d be there. Zazzle is overwhelming at first. There are so many products, and the design tool gives a lot of freedom when it comes to placing images, making text editable, and other things like that. I focused on common items at first, like badges, fridge magnets and keychains. I turned things into t-shirts where I could, including a special t-shirt version of the novel cover blue jay. I made random stuff like ping pong balls to see if anyone would buy one. The first year was pretty quiet, but I’ve been slowly building up the store. This paid off this year, as the festive season went well for me. The blue jay is one of my bestselling designs, to the point that it’s going to end up earning more than I’ve made selling the novel it illustrates. One reason this is working out well is it’s reaching new people. Most sales are either through Zazzle’s own search engine or third parties linking to a product. My writing tends to attract other people who aren’t that wealthy, but Zazzle attracts people with money to burn. I have to keep this in mind when I’m designing. I’d never pay that much for some of the items, but there are people who will. On the other side, the smaller items are in a price range that someone on a tight budget could afford, so I make sure I always have some of those for each design. Zazzle has an affiliate scheme that is part of their normal artist membership. I can gain referrals on anything I link to, including if I buy the item. It’s a very relaxed affiliate scheme, which makes a change from certain other programmes. My plans for next year are to keep expanding my designs. I want to do some more animals, as they’re popular designs. Probably cats, because cats are great. My blog used to have content that was more article-focused. I wrote about general issues of representation, the community, a bit about science in writing, and other things like that. This was never an easy road. Lack of support is a bit of an understatement. Negativity and death threats would sum it up much better. It might sound strange at first to switch to book reviewing, as authors behaving badly over reviews get a lot of attention. But that’s also precisely why I switched. When an author attacks a reviewer, people defend the reviewer as a matter of principle. That’s why you’ve heard about it. Reviews are an ideal area of blogging for a stranger, because the principle of letting reviewers have opinions doesn’t require being known or being popular. The number of death threats and the like has gone down dramatically. At the same time, I’m still talking about the same things as before. I’m just doing it in the context of specific examples, rather than broader overviews of an issue. I also hope this will do more good, as it’ll help people find / avoid books and other media. 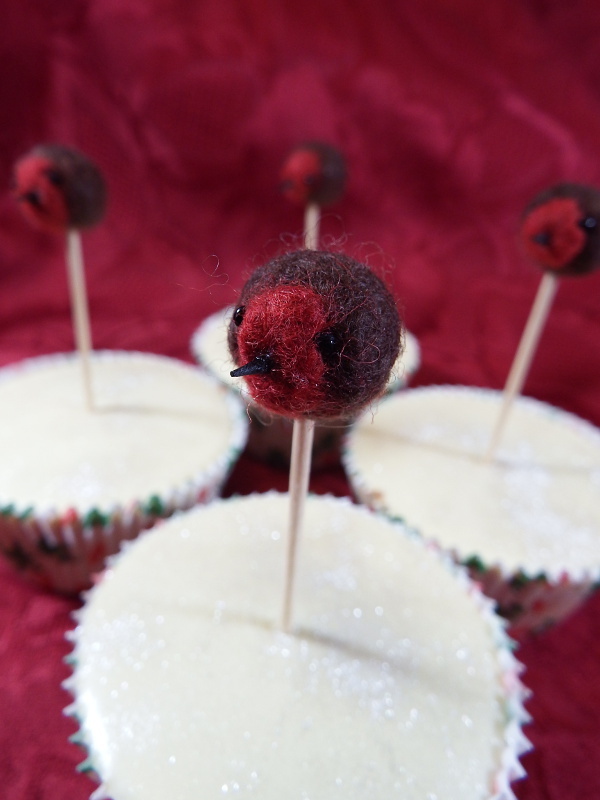 Though I do tend to look for work by marginalised creators, I haven’t limited the blog to this. I know from my own experiences that it can difficult to be the right sort of marginalised for blogs with limits. It’s also difficult for anyone who is quieter about their identity. So I review anything that I feel like reviewing, with a focus towards authors and stories that are underrepresented. Reviews are working as a way of producing regular free content. It means people can see I’m working on things, even if the big projects take more time to appear. It also passively promotes my other stuff (and stuff in my section for other creators) as it’s all in the sidebar. I haven’t hit the threshold for payment yet, but it makes sense to keep using this system as I link out to so many books (and other items). It is allowed to link to my own books, which is useful. I’m open to joining other affiliate schemes, but it has to be one where I’d have a chance of earning enough money to get paid. Amazon is chugging along about as expected, so I’ve no complaints, other than I wish I didn’t have to be paid by cheque. Patreon is something I couldn’t see working, because it requires having people who’ll sign up to pay money every month. I can’t work fast enough to provide guaranteed content as rewards, which makes my Patreon less appealing. But I do know people who run Patreon as a tip jar rather than a content subscription service. I didn’t see there was anything lost in trying. I don’t make much on Patreon, but it is paying for my website. It’s a small thing, but it takes the pressure off anything I earn. It means I can pay for things other than website fees, including getting review items and supporting crowdfunding campaigns. It also covers the website being more expensive this year, due to the exchange rate changes. Patreon pays me in dollars, and I pay my website in dollars, so it’ll keep covering the fees even if my home economy completely falls apart. I did do one Patreon-only post, which was a picture of a warm glow (the thing people get for supporting me). I did initially mean it more metaphorically, but there you go. I will likely do some other things sporadically, but it’s better not to commit to it and have it be a surprise, than to say I’ll do it and not deliver. My wishlist isn’t new. I started it up around my birthday one year and I’ve never had anyone buy me anything from it. But some people like buying stuff from wishlists as a way of support, so I cleaned it up and linked to it. This was late enough in the year that I don’t know if it’ll do anything, but any item will be a bonus. The list is mainly review items from the serious to the silly. This comes right at the end of the year, as it was part of setting things up for next year. After my art success, I wanted to put a few eggs in other baskets. The first I looked at was Redbubble, but I discounted it as it’d be a tax nightmare. Redbubble is in Australia, so they should be withholding 5% of my income to pay as taxes (under the tax treaty agreement with the UK). They don’t do this, and they say it’s up to artists to pay those taxes. Except it’s not, because the method for paying those taxes is through withholding, which Redbubble should be doing. Tax avoidance is something I try to avoid, so no Redbubble for me. Society6 is an American site, so it’s the usual 0% withholding deal. I’d like it better if they were keeping the proper forms on file, but either way, I’m only liable for taxes in my home country for any earnings here. Society6 is both simpler and trickier than Zazzle. It’s simpler in that it has fewer products and has simplified the process of putting art on stuff. It’s trickier because that means it has fewer tools. Things can’t be tiled or layered, it doesn’t show bleed lines and the like, it doesn’t take vector images… there are a lot of handy things it won’t do. Files at the biggest size are a problem when it comes to previewing. I’ve found the best way is to attempt to preview, then back out and try again tomorrow. It appears to figure out the preview in the break. All that said, the site does function and the products look reasonable. I do like that I can tweak product image placement after the product goes live. The product pages also show my other work very clearly to the customer: both what other designs I have on that item, and what other items have that design. There is an affiliate scheme (curators) which has to be signed up for separately. I’ve signed up for this. Also, payments will come in more regularly, as there isn’t a threshold. I know some people prefer to buy from Society6, so hopefully it’ll spread my earnings a bit. The result of working on everything else was I didn’t release any new books. What I did was work on projects as I felt like working on them. The pressure was off, which gave me some space to decide what I’d do next. I have a novella that will be released next year, at the same time as related cover art merchandise. This will be the first release that ties everything together. After that, I’ll be working on the second book in my urban fantasy series. This series is not something I can see as ever being popular, but if I’m making money on art, I don’t need it to be. I am still writing short stories, but the list of markets on my submissions list is a lot smaller now. It’s not the primary way I make money anymore, so I can be more selective. Next year, I will have a novella out at some point. I’m going to draw lots of pictures of kittens. I have been known to support crowdfunding campaigns, which means I sometimes get shiny things. Or very fungusy things. Here are my crowdfunding rewards crops for the season. 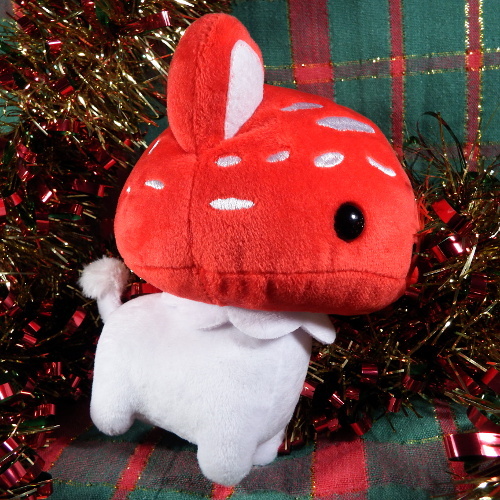 First is the mewshroom by Stitchmind (Andrew E. Yang). The mewshroom is a mushroom cat toy, who quickly settled in helping with the decorations. Image Caption: A cuddly toy mushroom cat. The cat has a large red head with embroidered white spots, a white body, frill just under the cap, and a fluffy ball on the end of its tail. 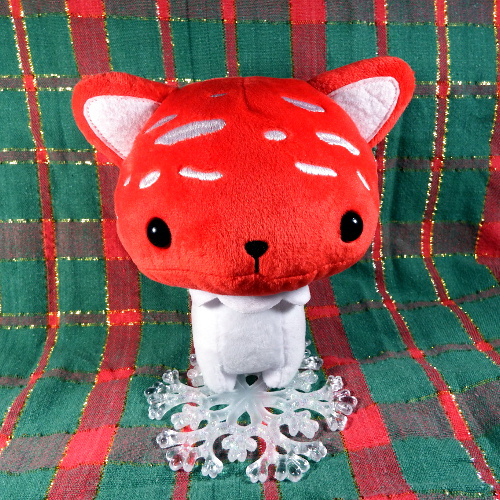 The mewshroom is playing with tinsel on a festive plaid backdrop (red and green with gold strands). Image Caption: Mewshroom faces forwards, showing two dark eyes and an embroidered nose. It stands on a sparkly snowflake ornament. I backed the campaign at the level for just the toy, though also got a sticker and badge thrown in. The fur is soft and it does stand up despite the huge cap. They come in other colours, but I went with traditional red. Stitchmind has a website where the toys are on sale, and a Zazzle store with related merchandise. 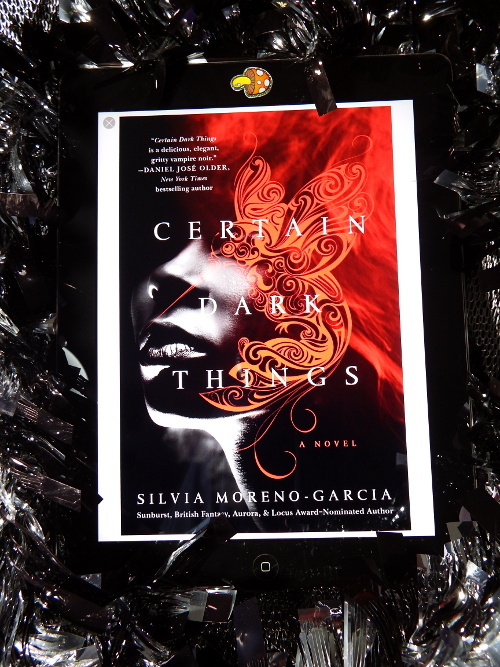 Second is an ebook of Certain Dark Things by Silvia Moreno-Garcia. This is a vampire novel set in Mexico City. I haven’t read it yet, but I’ll review it when I do. Tinsel probably doesn’t say horror and vampires, but it has some black in it so I’m sure that counts. I own a lot of tinsel. Silvia has a website with more about her writing, and the book is for sale on Amazon. Image Caption: An iPad on a background of silver/black tinsel and cloth. The screen shows the cover of Certain Dark Things: a face in black and white, with fire and red patterns overlaid. The iPad camera is covered by a sparkly mushroom sticker.